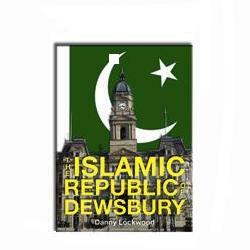 The Islamic Republic of Dewsbury by Danny Lockwood is a very interesting book which comes to some interesting conclusions, not necessarily the conclusions that those reading this book might expect. Two things come through immediately on reading this book. The first is Danny's intimate knowledge of Dewsbury and the second is his own personality. Whenever people or places in the area are mentioned Danny is encyclopaedic in his knowledge and often offers interesting historical background. This was one of the things that immediately gave me a good opinion of this book as some of the people and places mentioned are also known to me. Two obvious examples are his references to a local pub the 'West Riding' at Dewsbury Railway Station and one of several people mentioned in the book who are known to me is Colin Auty. I have spent many a happy hour in the West Riding drinking from their interesting range of real ales. Colin is of course well known to Nationalists. Danny makes clear from the very start of his book his personal affection for Dewsbury and his two great loves, Rugby League and Journalism (yes, I have got them right, Rugby League comes first!). Danny started his career as a trainee reporter at the Dewsbury Reporter, moved to other parts of the country to work on other titles, returned to Dewsbury as editor-in-chief of the Reporter. Since then he has set up his own newspaper, The Free Press (Dewsbury) along with some Rugby League titles. When dealing with Nationalists in the Dewsbury area the comment was regularly made to me by such persons as Colin Auty, David Exley etc. that 'we always get fair coverage with the Free Press'. His book has the staccato writing style of short sentences that marks out a journalist turned author. I seem to remember a claim that journalists on 'The Sun' were trained to get their point across in 11 words or less. Presumably journalists working for 'The Sun on Sunday' have a shorter word limit as many of their readers will still be hungover from Saturday night! Some of the chapters are self-contained. Other chapters in the book have a narrative running through them and some link to events in later chapters. Two examples of this are references in early chapters to a court case described in detail in a later chapter where Shahid Malik (at the time, the Dewsbury Labour MP) sued 'The Press' for libel (the jury could not agree a verdict in this case and the two then settled out of court) and his regular references to Baroness Sayeeda Warsi who of course is from the Dewsbury area. A couple of the early chapters give some interesting history of the area and refer to local persons who have become nationally known. There is a typo in this listing on page 66. Danny refers to such well-known figures from Dewsbury as Eddie ('oop and under') Waring and Mike Stephenson ('Stevo') both Rugby League commentators. In politics he refers to Baroness Betty Boothroyd, the first female speaker in the House of Commons and, er, 'former Labour politician Sir Marcus Fox MP'. He had better not tell the good Tories of Shipley who elected Sir Marcus as their MP for 25 years – he ended up as Chairman of the backbench 1922 Committee. I referred above to this book coming to some interesting conclusions and the most important one that runs through this book is that everything in Dewsbury is not a case of 'White good, Asian bad' like some sort of West Yorkshire version of Animal Farm. Danny strongly makes the point that, yes, there are persons in the Asian community who are venal, criminal, or both, although of course there are also persons in the non-Asian community to which those words could be applied. In fact he names some of the venal/criminal Asians but he also names Asian community leaders including some Asian Councillors who have at various times spoken out about the fractures between the two communities, who is behind it and what should be done. And that is where the real point is 'who is behind it' that Danny identifies, as did some of those Asian leaders who spoke out, and writes about in forensic detail. Yes, there are some Asian leaders who are part of the problem, after all the Markazi Mosque and Shahid Malik MP do not get nice write ups from Danny but the biggest part of the problem identified by him is the 'professionals' in the 'race relations industry'. It is in the race relations industries interest for there to be 'race relations problems' for them to have to sort out. After all if there were no such problems then the 'professionals' would be out of work and, sure as hell, turkeys do not vote for Christmas. As co-defendants on Danny's chargesheet you can add the local Council, Kirklees MDC and the local police force, the West Riding Constabulary. Living in Bradford I am well aware of the 'institutional incompetence' of the West Riding force. In his descriptions the vast majority of Muslims in Dewsbury are hard working people who just want to get on with their lives and he has a similar description of the non-Muslim community. As one of his examples of Asian leaders who have spoken out about the problems between the communities and identified who is behind it he mentions (page 155-156) Tory Councillors Khizar Iqbal and Imtiaz Ameen. Cllr Iqbal spoke out at a Council meeting in 2003 about the 'absurd political correctness, this fear of addressing the tough issues of the day, stopped.' Among other issues referred to in Councillor Iqbal's speech was the issue of 'second-language assistants in classrooms (they wanted English-only spoken)'. The result was a standing ovation from members of all parties. As Danny comments 'The vested interests of the race industry . . . were never going to be diverted . . . so casually' and so it has proved despite the fine rhetoric. Note in that quote he refers to 'race industry' not 'race relations . . ', his spelling sets out the agenda of that industry much more accurately than the normal spelling! Another example Danny quotes is the case of Lee Massey (page 246 onwards). The incident in which Lee Massey was nearly killed (his wife was asked three times by doctors if they could turn off his life support machine) started with greed by Kirklees Council! The Council agreed, in return for a substantial payment from the Home Office to provide housing for Iraqi Kurds, 'refugees' from Saddam Hussein's regime. Yes, other councils in England have provided similar housing for 'refugees' but the Council must have been well aware of the very volatile racial situation in Dewsbury. The Kurds were put into Islamic areas such as Ravensthorpe and Savile Town among Muslim populations many of whom regarded Saddam as a hero and the 'Western powers' offering sanctuary to the Kurds as 'Satans'. The Kurds are described by Danny as 'dissolute, non-English speaking' (page 250-251) and soon were in conflict with the local Muslim community*. In the Lee Massey case a gang of up to 20 of them attacked a group of drinkers at the Royal Hotel Ravensthorpe. When other drinkers came out of the pub the Kurds ran away. Two of the Kurds then jumped into a car, a Honda Civic, and drove it at the drinkers hitting Lee Massey. I have given above two examples out of the many vignettes that Danny writes about with great accuracy and detail in his book. The book is not a history of 'How those nasty Muzzies wrecked my beautiful home town'. It is more a fascinating insight by a local journalist who on occasions had serious pressure put on him to change his reporting of events, an insight into how a mixture of civic authorities, race relations 'professionals', media, police and politicians failed in their public responsibilities. He is particularly scathing and forensic in his details about how local politicians of all parties and ethnic origins used, abused and then betrayed local communities for political gain. Anyone, particularly from the 'milltowns' of the North reading this excellent book could easily cut out the various names involved in various incidents and insert the names of persons from their local community – that is how relevant this insight is! * A factual footnote. Danny Lockwood does not get the detail of the ethnic rivalry and hatred between Kurds and other Muslim groups. He assumes simplistically that it is a matter of 'Sunni-Shia . . trump Muslim-Christian every time in the hate and violence game,' (page 251). Er, no, a bit of simple research (I used Wikipedia) shows that Iraqi Kurds are predominantly Sunni the same as the majority of the local Pakistani population. The simple fact is it has nothing to do with religious sects. Kurds are loathed by their fellow 'Muslim brothers in peace' and this applies to Turkish Kurds, Syrian Kurds and Iraqi Kurds. Iran is a special case as the majority of Iranians are Shia and the Iranian Kurds are a mixture of Shia and Sunni – I could almost feel sorry for the Iranian Ayatollahs! The Islamic Republic of Dewsbury : (ISBN) 978-0-9570964-0-0. Paperback 8 ¼ x 6 314 Pages. Printed by The Press News Ltd. £14.95 Available from Amazon etc. Many thanks to Danny for providing me with a copy of his book. Ivan Winters has been wrongly linked to the a new party featured on Andrew's blog. However, hope not hate have turned up some interesting information that has turned out to be true: That he was convicted of fraud while being a treasurer of the local Tory group, which is sadly a fact. This was roughly 20 years ago, but fraud is still fraud and could be used against your reputation at any time by the opposition. The other allegation of him being an anti-fascist is unproven. I am sure that he will provide his own answers with respect to these allegations. Used against whose reputation? That of the new party proposed here? Excellent book, I have it on Kindle. Lockwood pretends to understand the situation, but does not. He writes off the EDL as racists and bigots, but as far as I can tell, has never been to a demo or entered into discussion with any members. I'm sure that makes him a friend of HNH/Searchlight. However it means that I won't be buying his book. Interesting RH. I did not realise that he took such a stance. Whether or not that makes him an active supporter of HNH/Searchlight though, could be another matter. The HNH/Searchlight was tongue in cheek, a reference to those that look to say the right things, but then try to get approval from the Lefty groups. Here's a good review of the book and of Lockwood. Esmie is a long term supporter of the EDL, has attended many London based demos and IIRC still lives in East London and has seen the changes in the last 50 years. Thanks for the link RH. I'll take a look. Esmie is a good writer. So he is in bad odour with HnH and in that he is in the very best company. It seems Ivan, that anyone who does not actively agree with Hope not Hate is liable to be attacked by them.